So after doing a big event for my biz, and not seeing the results I would have liked, I have been wanting to make bad choices. I want to pig out, stuff my face into a pie like I am trying to win a contest. I have been good though, I have not given in to these urges. However, when I vented to some other weight watcher folks one of them told me something, which I want to share with everyone else. To quote one of my favorite movies, Wreck it Ralph “labels not make you happy. Good, bad, nggghhhh… you must love you.” Why bring this up you might ask? Simply that I have been allowing labels to define to much of my life. Even more so with food, I to often thing of food as good or bad, which isn’t true as you will see. Food is a necessary evil, it is something that can very easily take over some of our lives. It took over my life, I was surrounded by the need for food, it made me happy! Well, it also made me fat. Since joining weight watchers I have had to come to terms with many of my demons. So why is there no good or bad choices when it comes to food? It’s a simple answer, because food does not define who we are! What?? How does that even make sense?? When we assign our food as good or bad choices, we are making our self-worth attached to it. If I make a bad choice, than it means I did something BAD. If I made a good choice, than I did something good right? Nope! Instead, we should look at as, is this a choice I will regret making? What that does is simply place the blame where it belongs, on the food. I know it sounds very similar but instead of saying my CHOICE was good or bad, I am instead asking how I will FEEL about the choice I made. It no longer is tied to my self-worth, it is tied to simple actions vs consequence. So when we make our choices, no matter if it is food or something else, remember to not tie your self-worth to that choice. I hope this makes sense, because I know for me it was very eyeopening. Not much to update right now, have not had a lot of time to get out biking due to weather and bike problems. That being said, still doing well otherwise, loosing slowly and steadily. I have about 12 pounds to loose by 01/09/14 to make a goal I set. Where did the 42’s go? I figured ok, they must just be out of stock and go look for a new style. Again though, the smallest I find is a 46 this time, without a 42 in sight! Row after row I search in vain, there are no 42’s! Then it hits me, the humor of it all, I am in the fat man section(known properly as the big and tall), and I am not fat enough! HA! Talk about a slap in the face of reality! I went over to what I call the normy section, and low and behold my 42’s! I go and try on the combo and I felt the shirt was a bit snug. When I looked in the mirror though I was shocked at what I saw! At home the only mirror we have is the one above the bathroom sink, so I don’t typically see myself often. Standing side ways I always look like I was pregnate and about to give birth, today however, I looked good! I even said out loud “WOW” because while I am still a bit plump I am far from being HUGE like I was before this started. 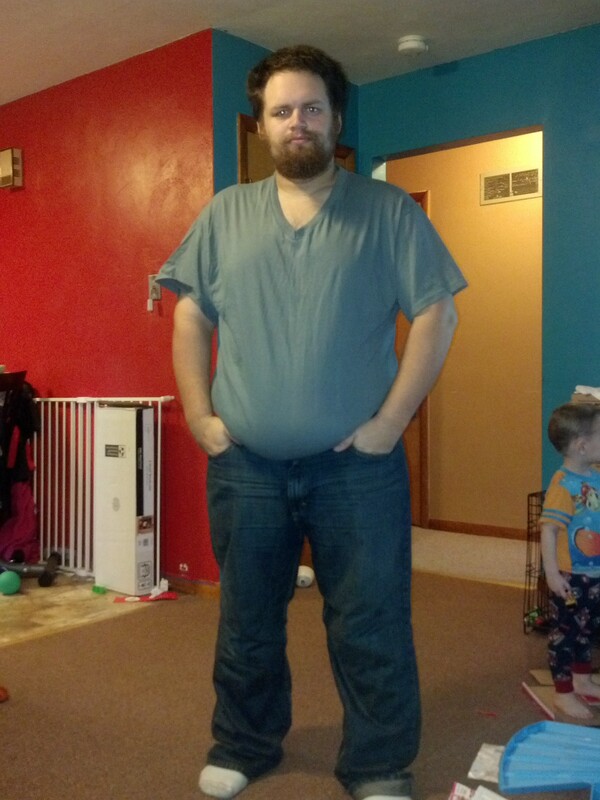 Here is a picture from the first day when I wore a 2XL shirt in over 5+ years . I sure do love my NSV’s!